Dining in the Dark at Noire Restaurant, Fairmont Dubai. I was in awe as soon as the doorman opened the door of the taxi and escorted us inside Fairmont Dubai. But my eyes grew wider at the sight of the five-star hotel’s impressive lobby. The lobby oozes pure luxury, there’s a fantastic art chandelier and a water fountain in the centre. There is a library lounge area and the walls feature framed black and white photographs of Dubai dating back 50 years ago. I later read that the hotel’s lobby had recently completed a multi-million dollar lobby renovation, and you can tell – it looks incredible! We whizzed up to the 9th floor to the hotel’s outdoor rooftop lounge, Dokuz. I don’t think we’ve said “WOW” so many times before. A masterpiece of a pool is the centre piece of the lounge area with absolutely mesmerising artwork. Tables and chairs are dotted around the pool in the middle of the rooftop lounge so we settled down with a cocktail. From Dokuz you can look over Dubai’s skyline and that evening we even got a glimpse of the Burj Khalifa glittering in the distance. Before our dining in the dark experience we sipped on cocktails in Dokuz and admired the views. At 8pm we were led to Noire Restaurant for a briefing about the whole experience. The waiters wear special headgear so that they can see and serve in the pitch black and afterwards you are able to go back into the room with the headgear yourself so that you can see the space! Saqib Hussain was on hand o tell us how the whole experience before we were led into the darkness. It was a strange but fascinating experience. I kept blinking my eyes thinking that they would soon adjust and I kept imagining that I could see light, but I couldn’t! Waving our hands in front of our eyes, we realised we could not see a thing. With the help of a guide we were led through the darkness and instructed on how to find our seat at our own private table. As there isn’t anything to look at I found myself listening to everything around me. We were mainly laughing at listening to everyone else struggle around us in the darkness as well. A glass of water and white wine was already on our table waiting for us. I was convinced that the white wine was red wine, it’s strange how the darkness can really change your perception! Our starters were served shortly after being seated. We were presented with Breaded Octopus with passion fruit jelly, sweetcorn puree, cucumber-orange salsa, carrot chips and smoked salmon roulade with stuffed cream cheese. Sitting in the darkness really opens your senses making you savour every flavour and aroma. Our starter was a lot easier to guess what we were eating however I did not expect the presentation to look like this! It felt such a shame that in the darkness I had probably completely ruined the perfect presented dishes in an attempt to get some food on my folk. The amount of times I put the fork to my mouth to find that it was empty was countless but all part of the fun and it really was a enjoyment and interesting experience. Following the experience we were able to meet the chefs and see the dishes we ate. Here are the photos of the dishes I took. Our main course featured Sesame duck breast with mashed white beans, paksoy baby corn, sun dried tomatoes, caramelised apples, crispy shallots and balsamic duck jus. An absolutely amazing dish full of flavour and my favourite of the three. In between courses we also had a refreshing spoonful of sorbet as a palate cleanser. For dessert we were served a delicious plate of Camel milk ice cream with walnut sponge, Oreo biscuit crumbs, lemon-apple jelly, toffee sauce and black pepper chocolate mousse. It was a great contrast of flavours, we could smell and taste apple pie but were confused by the chocolate flavours making us wonder what the dessert actually was! So it was great that at the end of our experience all was revealed. Each dish was equally impressive and o five-star quality. We also got to see the wine we had been drinking in the dark too. The menu changes at Noire every week in order to keep guests surprised every time and Noire ask for your dietary requirements before you dine. Noire has been award the Best Experimental Restaurant in the Middle East by the BBC Good Food Awards in 2015 and 2016. The team were even at Caterer Middle East awards the night we visited as they had been nominated! We were able to borrow the waiters special goggles to go back into the room and see our table (and the mess we had made!). I was pleased to see that my dessert plate was completely wiped clean, even in the pitch black I didn’t leave a crumb! Stumbling around it the dark we found it impressive how the team are able to serve you while wearing these tunnel vision goggles! 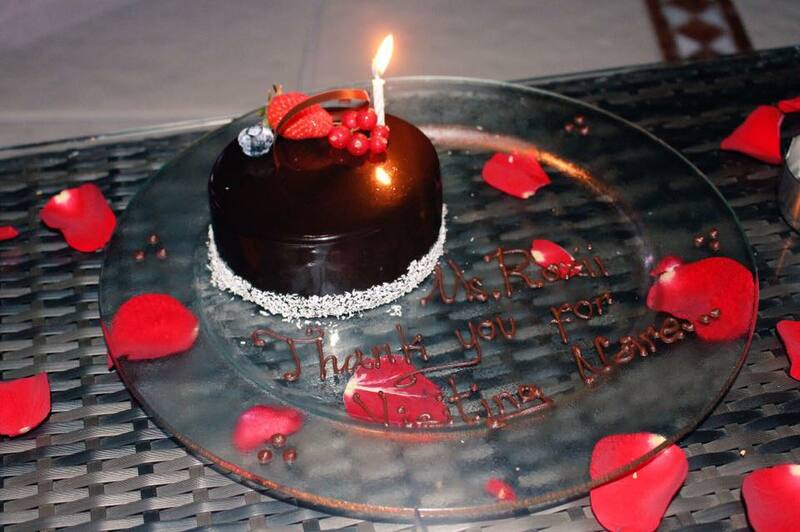 Following our fantastic evening at Noire, Saqib led us back to Dokuz where there was a cake waiting for us which had a special personal message for us. It was such an amazing gesture and just shows how amazing the hospitality at Fairmont is. We spent the evening chatting away to Saqib and the team, it was wonderful how friendly the whole team were. Dokuz has a relaxing atmosphere and you were made to feel as part of the family. We stayed until close sipping wine and looking out onto the Dubai skyline not wanting to leave our beautiful surroundings. It was by far my favourite evening we had in Dubai. The luxury hotel in Dubai is just 10 minutes away from The Dubai Mall (the world’s largest shopping centre, which is absolutely insane), Burj Khalifa, and the Dubai Fountain. We got there by taxi however the hotel is located directly opposite the World Trade Centre metro station. The dining experience at Noire lasts an hour and a half and costs 325 AED. The experience includes a surprise 3-course menu with paired drinks. Noire is open Monday to Friday at 7.30pm. If you are visiting Dubai then I highly recommend you visit. We had such an amazing evening!